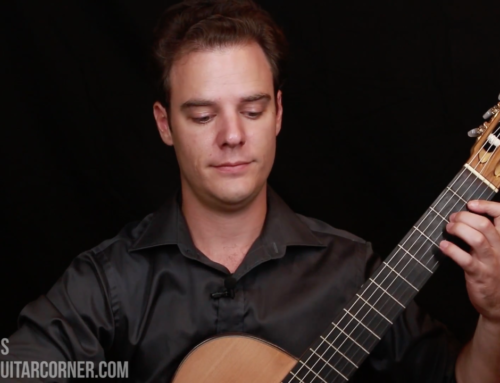 As you move ahead with classical guitar technique, we will be constantly looking to find more efficient and more accurate movements. Right hand preparation is a prime example of this idea and it will aid your playing with both control, accuracy, and efficiency. So far, in the right hand, we have been focusing on the movement of a single digit to make a stroke. The idea of right hand preparation (and yes we will look at left hand preparation too) is to start thinking about the digits that are not involved in the immediate movement but the following one. Just as a good chess player thinks several moves ahead, a good classical guitarist will be preparing fingers before they are needed. The concept of right hand preparation is quite simple: prepare a finger to play a string by placing the finger on the string in readiness before it is played. This results in more security and accuracy than without any preparation, however, by placing the finger on the string in readiness you will silence any note that may have been ringing on that string. This could be either desirable or undesirable, depending on the musical situation. Note: Before we go any further, know that preparation and planting are the same thing. I choose to use the term preparation, but planting is just as valid. To start us off, we will use our basic alternation between i and m. If you play the i finger on the open second string (B) then immediately place down your m finger on the same string you will end up with a staccato sound. If you continue this idea and place the i finger down on the same string as soon as you play the m finger you will get another staccato note. As you probably can see you are blocking the vibrations of the string by placing or “preparing” the next finger on the string. The finger does not play immediately but rather waits gently on the string until it is needed. This preparation on the string is the basic concept of right hand preparation. Once you have successfully, and comfortably executed a series of staccato notes on one string then move i and m to two separate strings. Now play i on the second string but this time bring down the m finger on the first string (E) in the same fashion as the previous exercise. Because they are now playing different strings you will no longer get the staccato sound, but you will be preparing the finger and also cutting the sound of the string that is not being played. As you play these prepared notes, try to keep the hand relaxed and get a sense of how this movement insures accuracy and control of the stroke. As I mentioned, the sound will not be staccato, but the preparation technique will cut the sound of the string you are preparing. The benefits of cutting the sound include good voice articulation, and clean melodic lines across the strings, but if you are trying to get the strings to sustain in a passage of music, preparation might not be a good choice. Now that we have looked at the basics of right hand preparation on the classical guitar let’s have a look at preparation in arpeggios. This is called sequential preparation. Right hand preparation requires some finger independence, which develops over time, so be patient and persevere. The goal is for the preparation to happen smoothly and in quick synchronization with the other fingers. While you may feel a little clumsy moving your fingers around right now, you will gain more confidence with time and practice. The movements become smoother and more efficient giving you stability and control, and you will find that the preparation time decreases until it might not look like you are preparing at all!. The preparation is also a great way to train the right hand to stay close to the strings and in position. However, you will find that in a piece of music, preparing your right hand fingers is not going to happen on every note and in fact you might just save it for some very particular moments when you want to control the tone of a particular note, or stabilize the hand. For instance if you have two very gentle notes, right at the beginning of a piece that you wanted to control, you could prepare your right hand fingers to play those two notes and execute them with accuracy. Similarly if there was a particular note out of a series of notes that you wanted to accentuate you might prepare that right hand finger well before it is needed. The last concept that I will introduce is the difference between full and partial preparation. We already had a look at sequential preparation, where each finger prepares in sequence. Full and partial preparation, are different in that there are multiple fingers prepared each time, rather than just the next one in a sequence. Let’s take another simple open string arpeggio. …then the sound of the strings would be abruptly cut every time the right hand prepared all four digits on the strings. To counter this effect we can employ “Partial Preparation” which simply refers to preparing some of the right hand fingers but not all. For instance in this arpeggio p, i, and m could be prepared but the a finger could remain unprepared, allowing the E string to ring on and make the arpeggio sound more connected after each repetition. For an in-depth look at this technique, take the Level 2 Technique & Musicianship Video Course in our membership packages! In this course I use close up video angles to show you exactly how to execute the technique.